PlayerUnknown's Battleground's 4th map, Vikendi (Dihor Otok) is slated to release before 31st December. Also known as the snow map, Vikendi is one of the most hyped maps of PlayerUnknown's Battleground. The PUBG community will be able to play the new map in the test servers before 31st December 2018.The map will also be included in the PS4 version of the game, which is set to be released tomorrow. 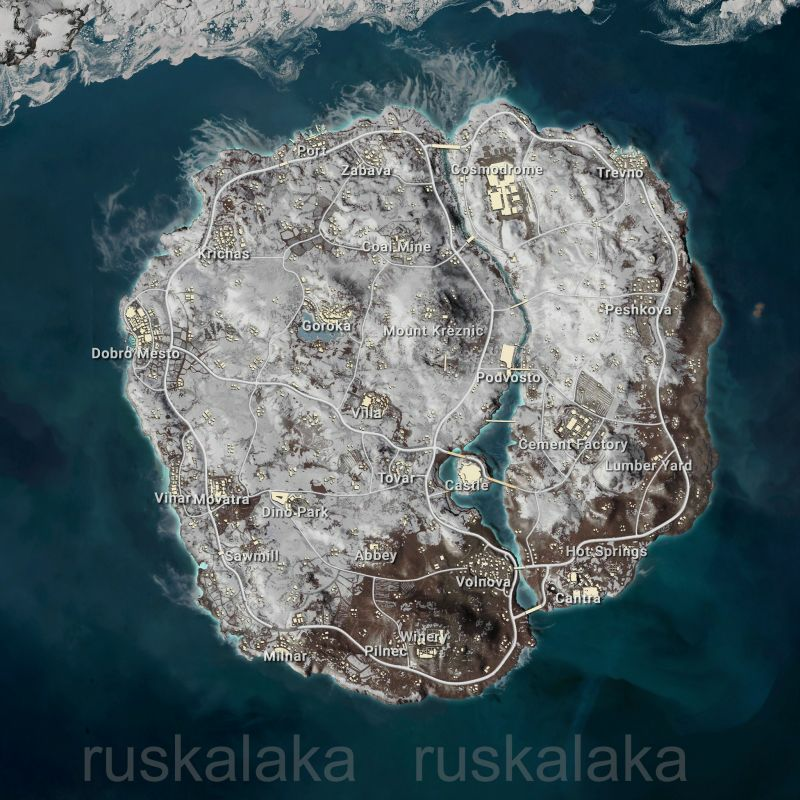 A new mini map of the snow map Vikendi was leaked earlier in a recent Reddit post titled "LEAKED: VIKENDI MINIMAP from pubgm" by user ruskalaka. The leaked map of PlayerUnknown's Battleground looks like the finalized version of the snow map 'Vikendi' as all the places in the map were labelled. The title in the reddit post says that Vikendi Minimap from pugbm which is a short form of PlayerUnkown's Battleground Mobile. We have already seen that the PlayerUnknown's Battleground mobile has been constantly supported by the developers. The mobile version of the game generally gets more frequent updates than that of other versions. This would not be a surprise as we already got the Sanhok map for PlayerUnknown's Battleground Mobile soon after the PC release. I think the developers are already working on the mobile version of snow map "Vikendi" and it may release within few months of the PC/PS4/Xbox release of the map. PlayerUnknown's Battleground community manager for Hong Kong, Taiwan and Macaw revealed the patch details of the latest patch 24 in a podcast with a content creator who goes by the name kimi69. The new patch would be including the following items and changes. There will be a new reward system for parachuting and rank, the player can earn better rewards with better rank and creative, fast parachuting techniques. A new and more advanced cheat engine will be added in the game which will ban players as soon as they turn on the cheats. The banned players' name will be displayed in the kill feed. Simply said, the new anti-cheat system will work same as we see in Rainbow Six Siege. The new snow map will be added in the test servers before the 31st of December. Not only that, the new snow map "Vikendi" will also include two weather types, most probably the night mode and the blizzard mode. Footprints are finally confirmed in the game and it can be used to track down players. Not only footprints, but it is also confirmed that vehicle tracks can also be used in the game to track down players. The PlayerUnknown's Battleground Community manager also confirmed that there will be new fast vehicle added in the new snow map, which gives clear indication of a vehicle like snow mobile has a high chance to be added in the new map. Canted Sights (red dots) are also confirmed and they will be added in PUBG patch 24.